Setting screen time limits is important to healthy childhood development, due to the findings of a recent study that showed, "preschoolers with better self-regulated emotional health – which is fostered by regular bedtimes, regular meals and limited screen time – appear to have better emotional and physical health outcomes later." Technology can also get in the way of good study habits and can serve as a distraction from building relationships or getting work done. One way to limit screen time is to introduce games that not only build cognitive skills but also foster motor skills, rule following and focus in a fun and entertaining way. 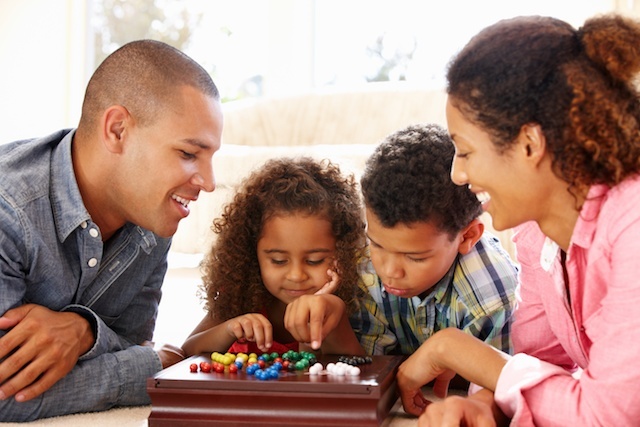 The following brain building games are great screen-free activities for a family night, party or to take along on a family road trip for hours of entertainment! Let's Go Fishin': This classic kids game teaches hand-eye coordination as players use their mini fishing poles to try to catch the most fish. Tangrams: A great way to teach kids about spatial relationships, tangram puzzles are travel friendly and offer hours of independent play. Telestrations: The telephone game on a sketch pad, Telestrations builds listening skills and boosts creativity. Chess / Checkers / Chinese Checkers: Strategy games are a great way to teach planning and critical thinking. Uno: This colorful card game helps with attention, pattern recognition, and reinforces numbers/colors. Bingo: Appropriate for all ages, Bingo is a great way to exercise listening and memory skills. Monopoly: A classic board game that has withstood the test of time, Monopoly offers lessons in financial planning, saving, and adapting to sudden changes (like going to jail!). Scrabble: This well known crossword game helps to build vocabulary and improve spelling. MindTrap: This brain building game for older kids aged 10 and up, taps into both the left and right brain for a full brain workout! Jigsaw Puzzles: A great way to encourage focused, quiet time, jigsaw puzzles help build cognition and improve fine motor skills. Looking for more screen-free activities for kids? Limit screen time with these ideas. At Brain Balance, we believe too much screen time affects the ability of the brain to form healthy connections, leading to behavioral problems and other developmental issues. To learn more about our program, contact us today!